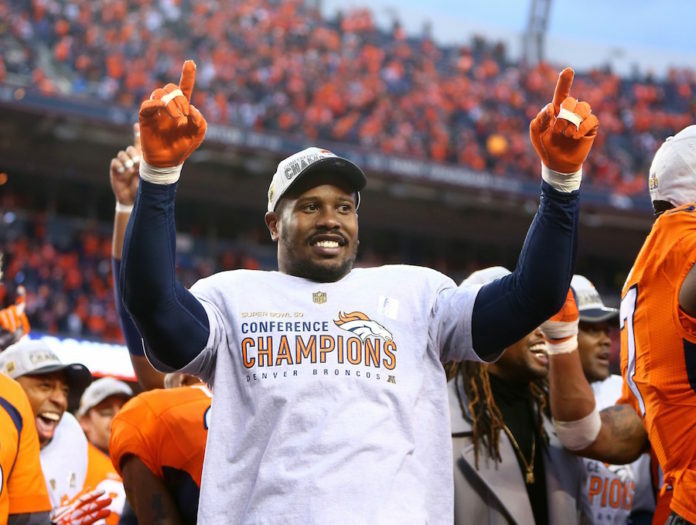 Von Miller deserves every penny of the reported $70 million guaranteed the Denver Broncos are offering. And it’s not greedy of him for asking for it. Miller is Denver’s best player and his being on the field is the difference between a good defense and a great defense. With five sacks, two forced fumbles and an interception, Miller was the best player in the NFL playoffs last year, plain and simple. He single-handedly won the Denver Broncos Super Bowl 50. From Jan. 7 to Feb. 2, Miller was the best football player on the planet and he’s about to be paid like it. But not everyone is thrilled Miller is about to sign the most lucrative defensive contract in NFL history. There are those that feel Miller’s contract will hamstring the Broncos down the road. Tying up $18 million-plus on one player is always risky, but so was signing an aging quarterback coming off four neck surgeries. Calculated risk is part of the NFL. Here’s why placing that risk on Miller and giving him what he wants makes sense. He was magical in the playoffs, but don’t forget Miller also has 60 career sacks in only 72 total games. That’s unbelievable. Miller has not only been terrorizing imposing quarterbacks since his rookie year, he’s been making everyone around him better. Sure, Miller has had his share of off-field issues, but those are behind him. Miller deserves credit for owning his mistakes and working to make himself a better person. He has become the prime example of how your mistakes shouldn’t define you. On the field and off there isn’t a metric that Miller hasn’t lived up to. Denver has playmakers at every position on the defensive side of the ball, but none of them are on Miller’s level. There’s no way the Broncos would have led the league in sacks last season if No. 58 wasn’t on the field. Teams have to scheme for the impossible task of stopping Miller, which allows guys like DeMarcus Ware, Shane Ray, Derek Wolfe and Shaquil Barrett to run free. A significant investment in Miller is a significant investment in the defense as a whole. Mark Sanchez isn’t Denver’s quarterback of the future; it’s hard to imagine a scenario in which he’s on the roster next year. If Sanchez has a decent year for the Broncos, he’ll be looking for one last big payday. If he doesn’t, he’ll probably be riding the bench mid-season. Trevor Siemian is an interesting story but if John Elway and Company were really head-over-heels for him they wouldn’t have traded up to draft a quarterback in the first round of the draft. Paxton Lynch is the quarterback the Broncos are building around and that gives the Broncos salary cap flexibility over the next five years. The quarterback position is easily the priciest in the NFL, so when teams hit a home run in the draft with a young quarterback it allows them to spend big money on other positions. Look no further than the Seattle Seahawks if you need an example of this. Over the next three years (the length Denver needs to guarantee Miller’s deal) Lynch will make $6.4 million dollars total. The money they are saving on a starting quarterback can easily be (should be) funneled to the best defensive player on the team. By the time Lynch needs a raise, Denver will be clear of Miller’s contract. The list of homegrown talent that Elway has let walk via free agency is looooong. The Broncos front office under Elway isn’t earning the best reputation when it comes to negotiating contract extensions or rises. At some point Elway needs to take care of the guys that have taken care of him. If he shows unwillingness to reward a player who clearly deserves a raise, he’ll risk damaging his reputation even further. This could start to hurt Denver’s ability to attract quality free agents. There isn’t a Broncos fan alive that doesn’t watch these highlights over and over again and grin from ear to ear. During his five-year career Miller has had his ups and downs. The good thing is those downs are in the rearview mirror and Miller is at the height of his ups. Miller is Denver’s best player and paying him as such is a no-brainer. According to reports, Miller is about to be a very rich man. Getting to this point hasn’t been easy, but $70 million should heal all wounds. Rewarding No. 58 with the biggest defensive contract in NFL was the right thing for Elway to do because Miller earned it.